... and then second pages making new choices for each step which created these designs but still using the same recipes. If you fancy taking a look at the photos from the day then please pop over to the Country View Crafts Project Blog. Thanks for stopping by, I'm hoping to get back into some designing and making this week so there should be some new projects from me very soon. Wow Brenda x I am loving these fabulous pages. I just wish I lived closer and then I could attend. Your recipe idea is a good one as my Mojo has gone MIA at the moment. What inspiration you always provide Brenda. The last one is my fav - ORANGE!!! But even if it wasn't, I love the sentiment! That said... they are all VERY VERY SPECIAL and LOVELY. So glad you were out making artsy memories this weekend. I truly believe that workshops can be life changing in many ways. Xj. Hi Brenda, love the journal pages. I tend to use my journals as a place to play with techniques and new stash, then I can go back to it when I need a bit of inspiration or to remember how I used them. They are kind of my private place where I feel free to let myself go and only occasionally let others look inside but these are gorgeous and it's really kind of you to share these lovely pages with us. Great journal pages Brenda, how I wish your classes were nearer me. It looks like you had a wonderfully creative day at your workshop Brenda. 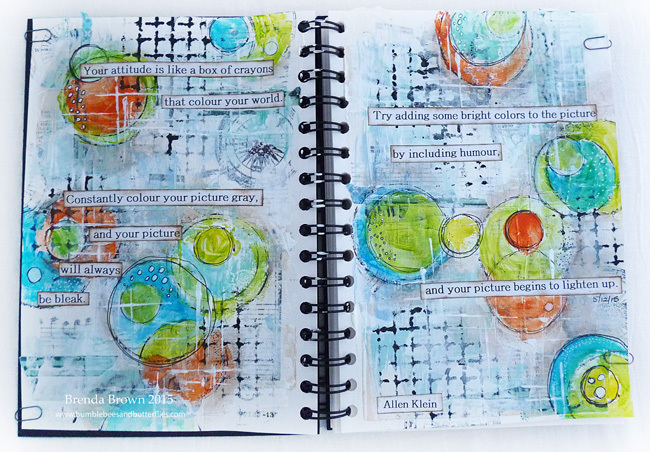 I love all of the pages...just a bit partial to circles though. Gorgeous inspiration. 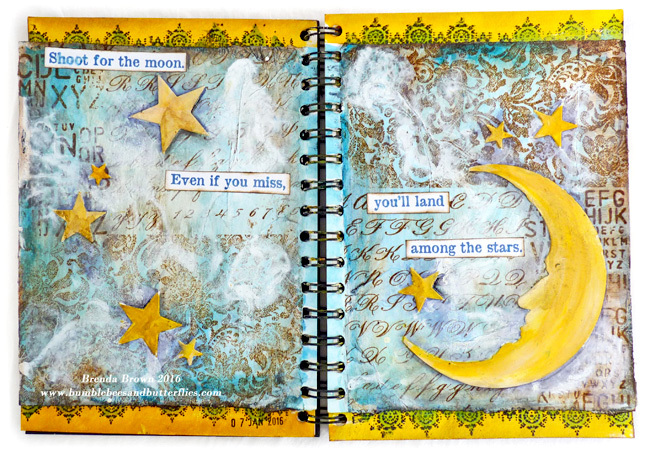 Awesome journal pages, Brenda! 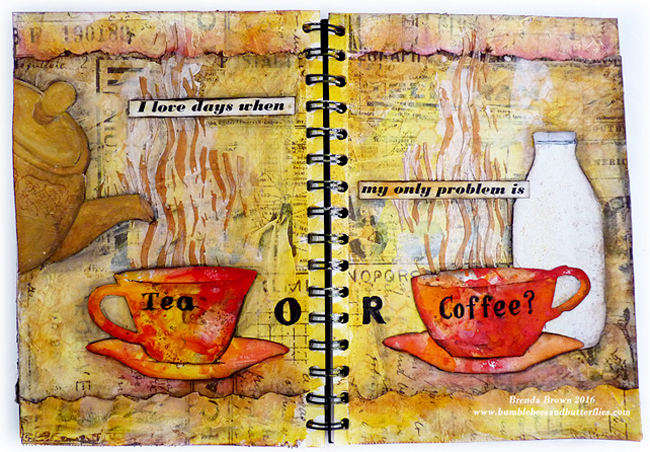 I love the freedom art journals provide. All those spreads are AMAZING Brenda - just great! All look fantastic Brenda, lucky ladies, I bet they all loved it!! They all look fantastic in their very own way, I love the depth and the different colour mood to each one. My absolutely favourite is the circle one (number 3) so dimensional! 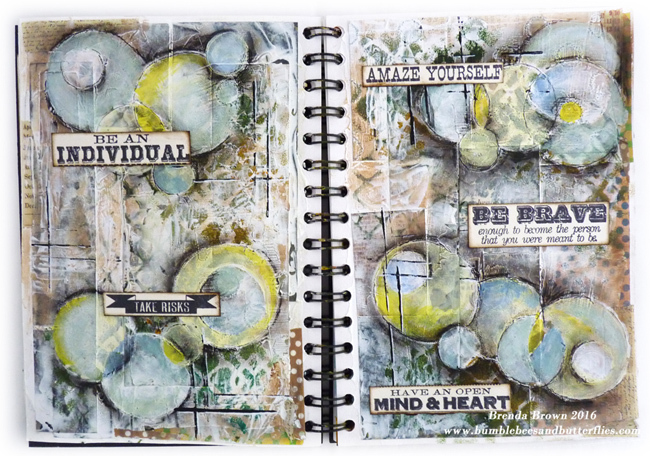 Fabulous journal pages! Brenda Each ones a Beaut and full of inspiration .